Smooth muscle cell proliferation and extracellular matrix (ECM) synthesis/turnover are thought to play an important role in vessel wall repair after vascular injury. Recently, we identified the cysteine-rich-protein-2 (CRP2) as novel and specific molecular effector of the NO/cGMP/cGMP-dependent-protein-kinase-I (PKG) signaling in vascular smooth muscle. To elucidate whether CRP2 contributes to the postulated pro-proliferative/proatherogenic effect of PKG, we established a CRP2-deficient mouse line by targeted deletion of the exons 2–7 in the CRP2-gene. With the simultaneous development of a novel ECM-specific MR contrast agent (BMS753951) non-invasive assessment of changes in remodeling of the injured mouse carotid wall has become feasible. In this study we investigated whether the use of an elastin-binding contrast agent would allow the detection of vascular remodeling in a mouse model of carotid artery injury and whether it would facilitate the detection of impaired ECM formation in CRP2-/- mice. A carotid artery injury model was performed in 8 wild-type and 8 CRP2-deficient (CRP2-/-) mice; the right carotid artery wall was damaged, while the left served as control. 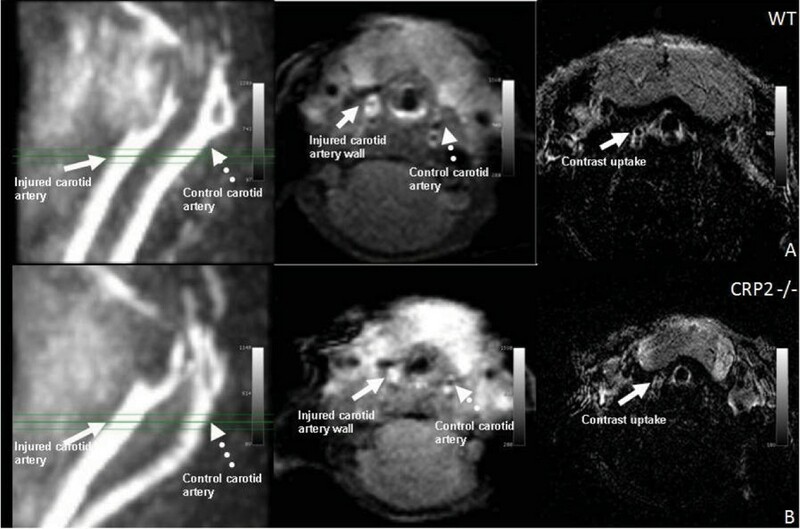 Two month after surgical intervention, MRI of the carotid vessel walls was performed in a 1.5 T Philips Achieva clinical MR scanner using a single loop small animal coil, a dedicated cardiac software package (R1.2.2) and a clinical gradient system (30 mT/m, 150 mT/m/ms). Time-of-flight angiography of the carotid arteries was performed for visualization of the injured vessel segment and for subsequent planning of the vessel wall scans. Imaging parameters included TR = 43, TE = 8.1, flip angel = 60°, spatial resolution = 0.2 × 0.2 × 0.5 mm. For assessment of ECM remodeling, an inversion recovery vessel wall sequence was performed approximately 45–60 minutes post injection of 0.1 mmol/kg of BMS753951 (Bristol-Myer-Squibb/Billerica/MA), a novel elastin-binding Gd-based contrast agent. Imaging parameters included TR = 44, TE = 11, flip-angel = 30°, spatial resolution = 0.1 × 0.1 × 0.5 mm, 22 lines per RR-interval, inversion time approx. 250 ms. Signal-to-noise and contrast-to-noise-ratio (SNR, CNR) of the injured vessel wall was determined by manual segmentation of the visually apparent signal of the contrast agent below the carotid bifurcation. Noise was determined within a region of interest drawn outside the animal. To verify our MR data, we performed histological elastic-staining in a 10 μm-whole-neck paraffin-slice using the common Elastica-Van-Gieson-method. 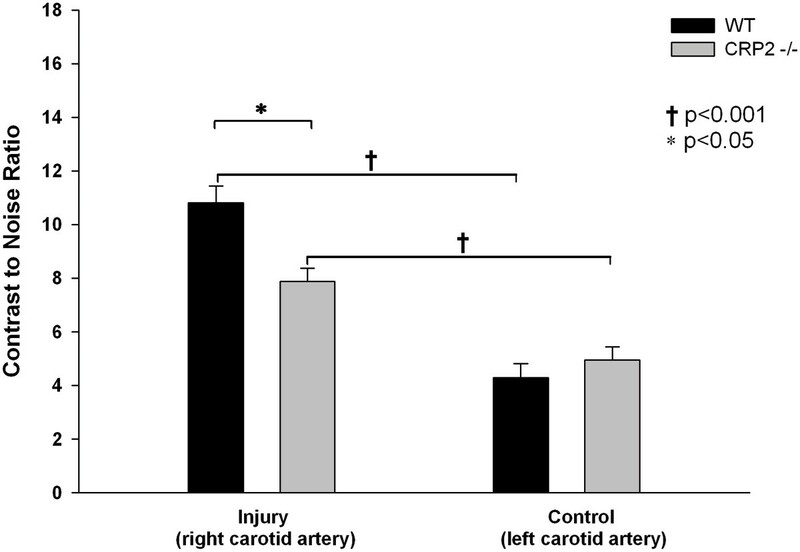 SNR and CNR of the injured right compared to the non injured left carotid artery was significantly increased (p < 0.001) both in wild-type (SNR: 12.9 ± 2.2 vs. 5.8 ± 1.9; CNR: 10.8 ± 1.8 vs. 4.3 ± 2.3; Figure 1A) and in CRP2-/- mice (SNR: 9.4 ± 1.6 vs. 6.4 ± 2.1; CNR: 7.9 ± 1.8 vs. 4.9 ± 1.7; Figure 1B). More interestingly, SNR (12.9 ± 2.2 vs. 9.4 ± 1.6) and CNR (10.8 ± 1.8 vs. 7.9 ± 1.8) of the injured right carotid artery of CRP2-/- mice was significantly decreased when compared to control animals (p < 0.05) (Figure 2). No significant difference was found between non-injured carotid arteries of both genotypes (SNR: p = 0.35, CNR: p = 0.36). In both genotypes, the carotid injury per se was confirmed in 10 μm-whole-neck paraffin sections stained with Elastica-Van-Gieson (Figure 3). Preliminary evaluation of the carotid wall thickening seem to confirm our MRI findings and suggests that targeted deletion of CRP2 in mice might lead to a reduced vessel wall thickening and thus to a reduced restenosis after vascular injury. However, the semi-quantitative analysis of carotid vessel wall thickening in both genotypes is currently still under investigation. In this study, we demonstrate the successful use of molecular MRI for the non-invasive assessment of alterations in the vessel wall after vascular injury in a mouse model of impaired smooth muscle cell proliferation and ECM formation. 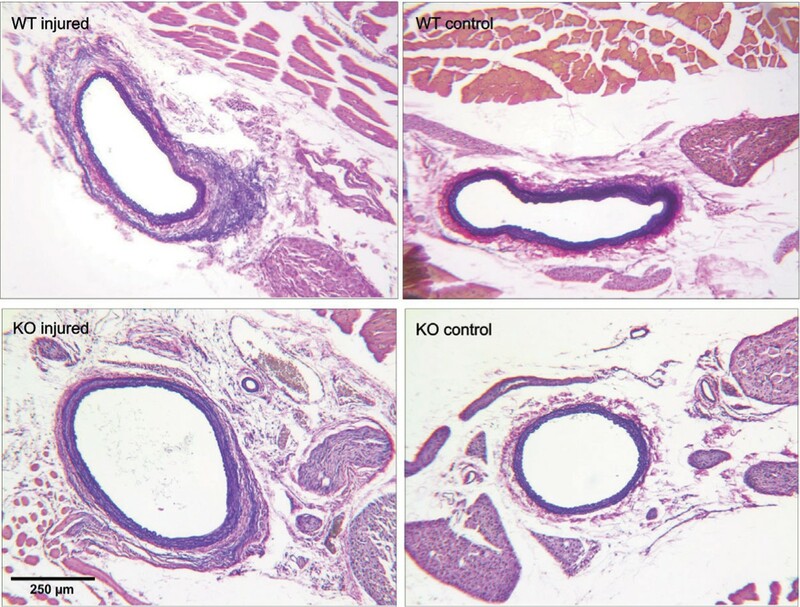 The use of BMS753951 allows the differentiation of molecular alterations in the injured and non-injured vessel wall, as well as between wild-type and CRP2-/- mice with regard to elastin formation after vascular injury.